What The Gel Is This? 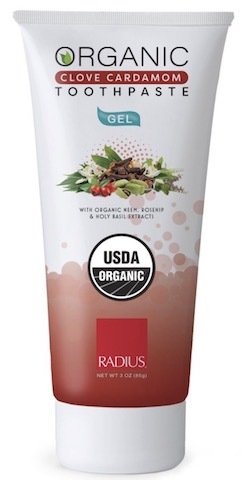 Do more with your two minutes and organically refresh your brushing routine with our new USDA Organic Gel Toothpaste. A unique blend of plaque-fighting organic erythritol, nutrient-rich coconut water, calming chamomile flower, and a light, natural foam gives you that fresh-from-the-dentist feeling without any harmful additives. Just like our bestselling pastes, our new gels are USDA certified organic and don’t contain any unpronounceable chemicals or additives found in similar products. Take a peek at our labels. You won’t see any trace of chemicals, pesticides, GMOs, glutens, fluoride, saccharin, SLS, SLES, carrageenan, parabens, detergents, or synthetics of any kind. Just clean, natural, and safe ingredients. Our flavor combinations are as gelicious as they are effective. Made with organic rice powder to gently polish your pearly whites, try our earthy Matcha Mint or spice up your routine with our Clove Cardamom. Every container is handily travel sized and TSA compliant, so you can enjoy the RADIUS toothpaste taste, feel and peace of mind wherever you go.